The appearance of the Spotted Lanternfly in Berks County, Pennsylvania in 2014 has now escalated into an infestation threatening the entire northeastern United States. This invasive insect is endangering Pennsylvania’s grape, apple, and peach industries which are collectively valued at more than $4.9 billion. The state’s forest products valued at $19 billion and nursery and landscape business valued at $944 million are equally in danger from the this troublesome pest. In all, the insect feeds on more than 70+ plants and there are no native spotted lanternfly predators to make any noticeable difference in the population. According to the National Federation of Independent Business (NFIB), the Spotted Lanternfly infestation may also have harder-to-quantify risks. In a recent webinar, Dana Rhodes of the Pennsylvania Department of Agriculture highlights these risks. Rhodes says the infestation can affect property values and quality of life, tourism and assets like the state’s park system (ranked #3 in the nation), the state’s natural ecosystem, and new business initiatives. The impact also extends to companies dependent on these state assets, many of them local small businesses. 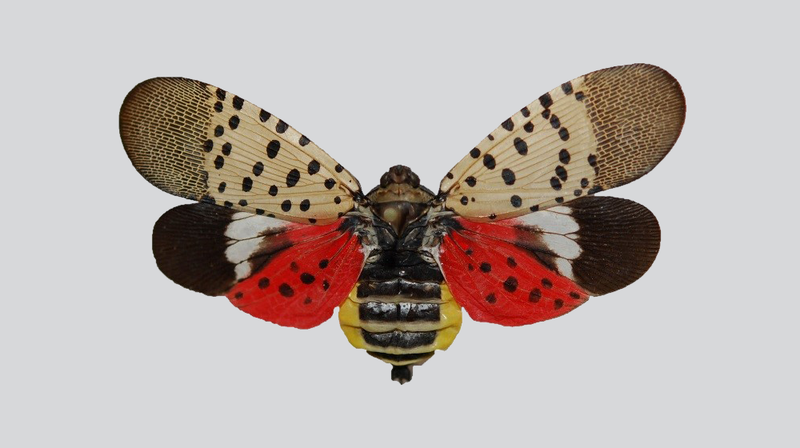 The Spotted Lanternfly or Lycorma delicatula is an invasive insect native to China, India, and Vietnam. In addition to Pennsylvania, it has been spotted in New York and New Jersey with other neighboring states on alert. The Pennsylvania Department of Agriculture says the invasive species has the potential to greatly impact the grape, tree-fruit, logging, nursery and landscape industries in the state. Protecting these industries will require early detection, enforcing quarantines on locations already determined to be infested, and educating the public to help officials limit the spread of this infestation. State officials want anyone living outside of the quarantine area to report sightings of the insect. You can call 1-888-4BAD-FLY (1-888-422-3359) or click on this link to do it online. The quarantined counties are Berks, Bucks, Carbon, Chester, Delaware, Lancaster, Lebanon, Lehigh, Monroe, Montgomery, Northampton, Philadelphia and Schuylkill. State officials are issuing permits for businesses in these counties to move equipment and goods in and out of the zone. In association with Pennsylvania State University and its Penn State Extension, the department of agriculture has developed a course to train designated employees on how to comply with the quarantine. You can take the permit training here. According to the Penn State Extension info page, the Spotted Lanternfly attacks fruit trees, but not the fruit itself. It feeds on the sap in trunks, branches, twigs and leaves leaving a greyish or black trail along the bark of the plant. When it is digesting the sap, the insect excretes what is known as honeydew. The honeydew and sap become a medium for the growth of fungus, such as sooty mold. This can cover the leaf surfaces of the infected trees, fruits and vegetation and stunt their growth. If the infestation is pervasive, it disrupts photosynthesis and the plants may not survive. The Spotted Lanternfly is around one inch long as an adult, but looks quite different during the developmental stages of its life. The images below show these stages. If you see a specimen at any stage, report the sighting. If you choose to collect the specimen, it can be turned in to the Pennsylvania Department of Agriculture’s Entomology lab for verification. You can also take a picture of it and send it to Badbug@pa.gov. The Spotted Lanternfly has a preferred host, a plant called tree-of-heaven, which is also an invasive species, introduced to Pennsylvania from China in the 1780s. The US and Pennsylvania Department of Agriculture are removing this plant, as well as leaving trap trees baited with insecticides, and deploying control and eradication measures in the quarantine zones. If you see an egg mass, the agriculture department says you can scrape it off, double bag it and throw it away. You can also put the eggs into alcohol or hand sanitizer to kill them. As far as Spotted Lanternfly predators, there aren’t enough of them to make a difference. There are spiders and praying mantis, but they can’t make a dent because of the rate at which the insect propagates. And remember to always report any sightings. This is the best way to help eradicate this infestation. 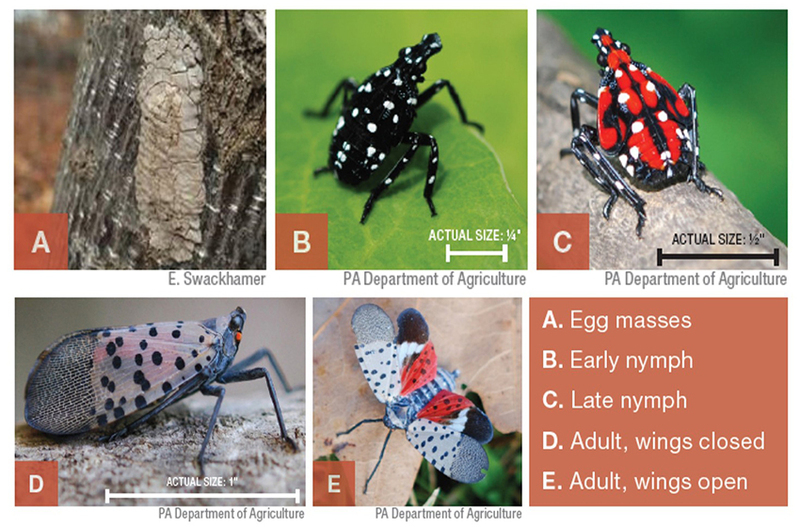 The Penn State Extension has comprehensive information about the Spotted Lanternfly and the measures being taken by state officials. You can access the site here.